Regional Development Australia – Far South Coast (RDA FSC) manages and coordinates the Shoalhaven Youth Volunteering Initiative (SYVI). The project, since commencing in 2001, has enabled 3,500 Shoalhaven students to take part in accredited training with local service agencies including Rural Fire Service (RFS), State Emergency Service, NSW Police, Surf Life Saving Australia and NSW National Parks. Each year, SYVI train approximately 120 students per year. Indigenous participation exceeds 5% and demand from Year 10 Students is such that the project could easily train more than 200+ students per annum. Accredited and nationally recognised training is undertaken at the Emergency Management Centre in South Nowra and the Rural Fire Service facility in Milton. Students are treated as adults during the training period and a supervising teacher accompanies them to the course and training. The supervising teacher often completes the training as well and often becomes an RFS volunteer member. Training (theoretical and practical) is completed over one week (5 days) with an assessment on the last day. Students who are successful in completing the training are presented with two certificates at an end of year assembly; one certificate from RDA FSC/SYVI and the Bush Firefighter Certificate from RFS. As well as achieving an accredited qualification, the students gain life skills and an insight into the benefits to the community of volunteering locally and nationally. 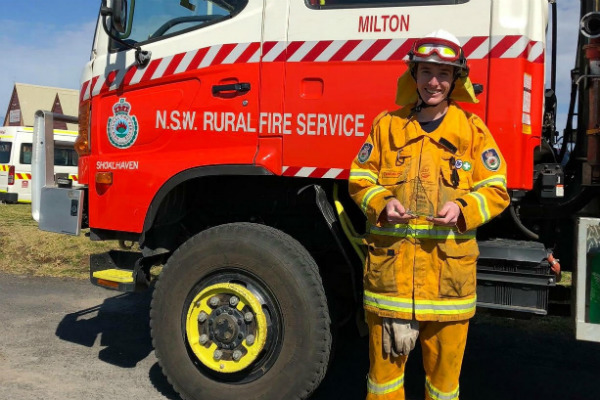 Both the State Emergency Service and Rural Fire Service in NSW have introduced cadetship programs, which are based largely on the SYVI project model.